Released at a time when hopes were high that British cinema would be able to compete with Hollywood, this historical fantasy was massacred by the critics. 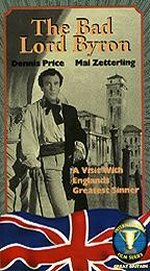 It hasn't really improved with age, although it provided Dennis Price with a useful run-through for the role of the equally caddish Louis Mazzini in the following year's classic Kind Hearts and Coronets. There is precious little biography on display, but the way in which the script whizzes you round the celebrities of the day is quite fun.